The world’s leading source of news from Rupert Murdoch today slipped a press release out from under the BBC’s protective skirts and admitted that it wasn’t prepared to show the Gaza appeal for humanitarian aid either. 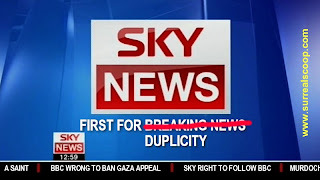 "Sky News has reviewed the DEC appeal and can confirm that there is nothing in it about Rupert Murdoch or his interests," said a spokesman for Sky News. "This is a question of being absolutely impartial in our output and we simply aren’t." Sky took its decision like the responsible broadcaster it pretends to be by featuring reports on the BBC’s decision not to show the appeal and by loading Sky’s website stories with people’s outrage at the BBC. "We aren’t expecting many people to demonstrate against our decision," said the spokesman, "Few Sky subscribers can get off their sofa on a January morning, and fewer still are capable of walking a few miles." Sky News today held an impartial interactive survey asking it’s red-button thumping viewers "Is Sky News right to follow the BBC? – vote "Yes" or "No the BBC is wrong". However one of the Sky News crack news reporters said that she did not understand why there was so much debate given the past record of the subject matter. "I don’t understand the fuss," said lunchtime news anchor Kay Billingsworth. "I mean does Gazza really need the money so much, maybe he should just stop drinking." The Beeb should broadcast it though. Won't someone think of the children? LOL - striahgt to the ehart of the matter! Nice work.